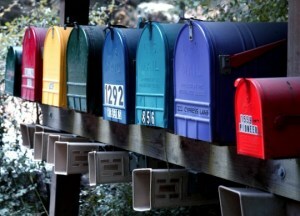 Mailbox Monday is the brainchild of Marcia and more information can be found here. This month it is being hosted by Serena at Savvy Verse & Wit. I have had great luck recently when it comes to new books. (Hopefully I don’t jinx myself with that statement!) This week was no exception. 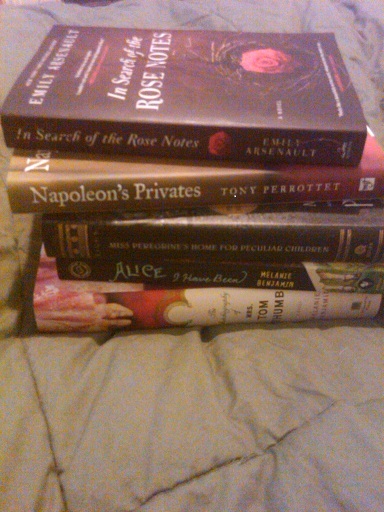 I got a total of five books, although only four are shown, as my husband already absconded with one of the books! A Train in Winter, by Caroline Moorehead, is for an upcoming TLC tour. This one is about a large group of women involved in the French Resistance who were imprisoned at Auschwitz during WWII. The Marriage Artist, by Andrew Winer is this month’s choice for BOOK CLUB. More information can be found here. The discussion will take place on October 25 at Linus’s Blanket. I know very little about this book but I am looking forward to it! A Watershed Year, by Susan Schoenberger is another TLC tour book. The premise reminds me of Ceceilia Ahern’s book PS, I Love You, only in this case a woman is receiving emails from her friend after he passes away, so I am anxious to see whether it is at all similar! The Rules of the Tunnel, by Neil Zeman is a mystery to me. I can’t remember if I won it or agreed to review it or what. So I am sorry–I feel like a jerk! It’s a memoir by a person that suffered severe depression and anxiety. As someone who has battled an anxiety disorder my entire life, I am always open to books on that subject. The last book I received, which is not pictured, is The Night Eternal, by Guillarmo Del Toro and Chuck Hogan, which is book #3 of The Strain series. My husband enjoyed the first two books so when I got this one in the mail, his eyes lit up. He bragged to his coworkers the next day that he was going to get to read the book before it even came out! Time for you to spill and let me know what came into your house this week! Yay, another Monday! I always relish looking through other people’s mailboxes. 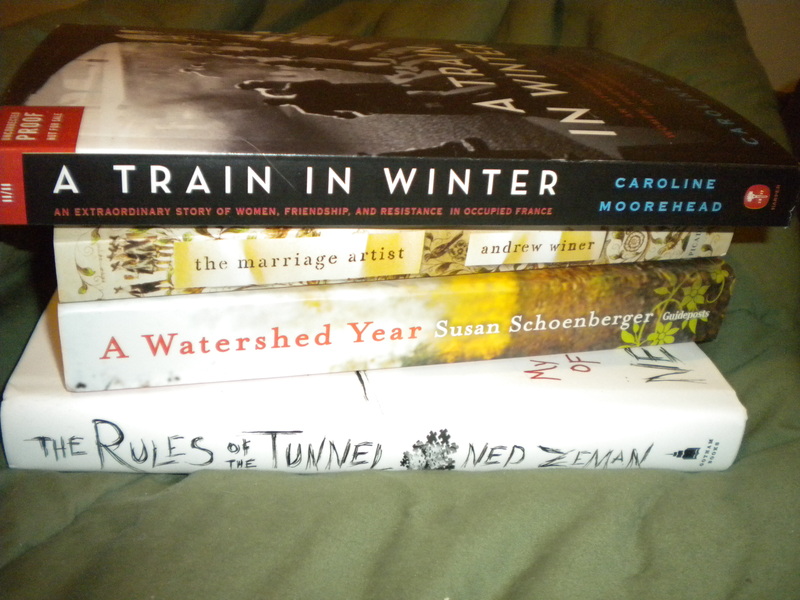 My mailbox was quite generous this week, and I ended up with five new books. The Days of Abandonment, by Elena Ferrante: This one was sent to me by Care of Book Club Care. She saw a post of mine where I talked about the Europa challenge and she immediately offered to send me her copy of this Europa. She said it is the second favorite Europa that she has read before, so I am excited to read this one and discuss it with her. Inner Circle, by TC Boyle: I have longed to read more from Boyle and when I saw this one for $1 at Half Price Books, I couldn’t resist. Plus, apparently it involves themes of matrimony and infidelity, which always grabs my attention. Slaughter on a Snowy Morn, by Colin Evans: I was itching for some historical true crime the other day at my aforementioned trip to Half Price Books, so I grabbed this one. If I can fit it in for RIP, it would be the perfect fit. The Post Birthday World, by Lionel Shriver: I have been meaning to try more from this author ever since I read We Need to Talk About Kevin, which was phenomenal. This one is yet another book on infidelity. I like my novels salacious! Practical Jean, by Trevor Cole: This one is for an upcoming tour, so watch for my review on November 7! It sounds like more of a dark comedy, which is right up my alley. Have you read any of these? If so, spill!! Another Sunday. They seem to roll around quicker and quicker. I have to work today, so that’s really all my plans consist of. Maybe I will get some reading done later tonight, maybe not. I recently got some new books, so I thought I would go ahead and share. The top book, In Search of the Rose Notes, was sent to me by the publisher to participate in a tour for TLC. I am actually planning on starting it today, and I am really looking forward to it. The next two books I purchased from Barnes & Noble the other night. My husband and I went to the local shopping center to get take out and we spent some time browsing. Napoleon”s Privates is a book I have had my eye on for a few years, so when I saw it on the bargain shelves, I snagged it ASAP. Miss Peregrine’s Home for Peculiar Children piqued my interest straight away. The incorporation of vintage pictures, coupled with the cover and the storyline have me convinced I will love this one. 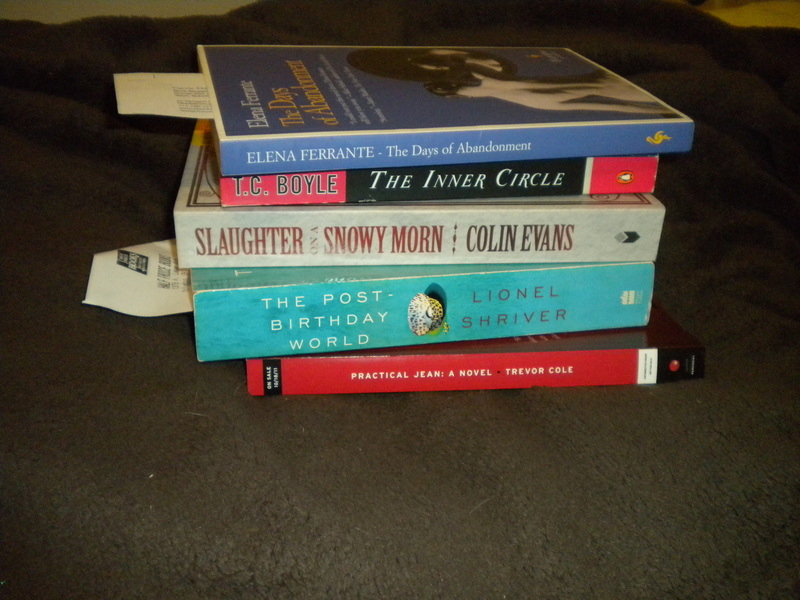 Lastly, I picked up some books at Borders. They were 30%, plus I took advantage of my Borders Reward card, since it ceases to be of any value today, which gave me an extra 10%. Call me dense, but I had no idea that Alice I Have Been and The Autobiography of Tom Thumb were written by the same author! The former has been on my wishlist since it came out because tons of bloggers wrote very positive reviews. The latter was just published and from the very first review I saw of it, I knew I had to read it. My expectations are sky high! Have you read any of the books I got? Please spill it and let me know your thoughts!